The lethal young ladies of Kittie show that they are going to be around for a while with their second album "Oracle". When their debut "Spit" came out, they were looked on by many as a novelty act, like a metal version of The Runaways. Could they keep up the momentum and prove they were for real? "Oracle" should settle the argument. This is an all-around heavier and more focused record than "Spit", which vacillated between metal and alternative rock. "Oracle" is metal through and through, thundering along with some brutal low-tuned riffing and plenty of throat-ravaging howls from singer/guitarist Morgan Lander. The band's approach tends towards the punishingly slow and methodical instead of all-out thrashing. You can't question the heaviness and intensity of the material here, but it is rather one-paced and fairly monotonous, with most songs based on simple mid-tempo riffs. This is not technical music by any stretch and the girls don't try to push themselves past their limits. I for one would like to hear some more variation and guitar soloing from Morgan. It's Morgan's vocals that make Kittie the band it is. She is really one of the most intense performers in heavy rock and many of the tracks revolve around either that raw, anger-filled rasping or her more delicately melodic "real" singing. Often the styles overlap. It's Morgan's fiercely impassioned approach that sets Kittie apart. 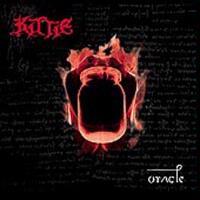 "Oracle" is a solid second album that sees Kittie tightening up considerably and laying some more groundwork for what looks to be an exciting future. Short and to the point, this is brutal metallic minimalism, based on simple choppy riffing. Morgan's singing is painful and raw all the way through. This one picks up right where "Oracle" left off, with what sounds like the previous track's riff played in reverse. It's a longer track, and Morgan uses her softer vocals in a few spots. This is one of the most interesting tracks on the album. It's very heavy, but the song doesn't seem as brutal as the rest of the material. Morgan's vocals are beautiful and compliment the song tremendously, giving it an almost ethereal touch. The bass-drum interplay leading this off is childish in its simplicity and the track is about as basic as you can get. It's extremely heavy but not challenging in the least. This cover of Pink Floyd's classic is one of the most interesting tunes on the disc. It's hard to hear the original in the thumping metal riffing but when Morgan's voice comes in, you recognize it at last. She sounds especially fierce when she spits out "They're gonna send you back to mother/In a cardboard box/You better run!" More of that typical chunky Kittie sound here, but this time it has more of a nervous feel to it. They're not pushing the envelope very much with this. Another short and sweet shocker, this one has a bit of a death metal feel to it, especially on the chorus. Like "In Winter", this is another combo of melody and muscle. Morgan's harsh and sweet vocals are mixed together to great effect on a very powerful chorus line. This is a dark and ominous ballad, played mostly on piano. It's very gloomy stuff and finally gets really heavy in the last quarter. A she-wolf's snarl ignites this bruiser, which reminded me a lot of old Obituary with some of its riffing. It's the closest they come to all-out death metal. Boy, you can't get much more uncommercial than this track, a droning, doomy dirge that drags on for almost ten minutes. This is SLOOOW with a capital S and will test the patience of all but the most committed doom metal fan. There's a lot of squalling feedback and noise, too. The track does intensify in the final third before returning to the original sludgy feel. This is quite a surprise and will probably have many of the mall metal fraternity scratching their heads.